Seniors working with their mentors, spring 2014. Wondering how you might give some useful time to a high school student for the next several months? 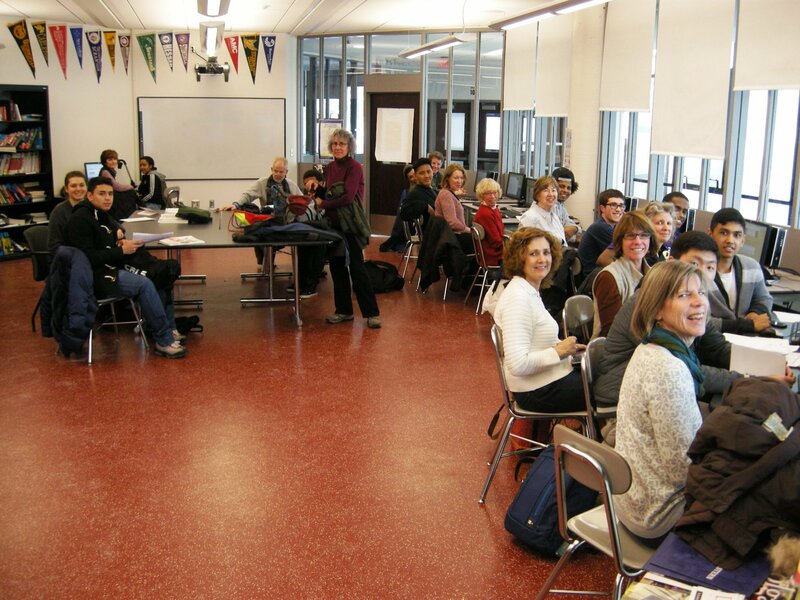 We have the answer for you: the College Ready program at Cambridge Rindge and Latin School (CRLS)! To become involved with this exciting program, read on. CSV is currently recruiting volunteers to help seniors with the college preparation and essay writing process. The program officially begins with a kick-off training on Wednesday, October 8, from 1:00 to 4:30 PM at CRLS. Once you have been trained, weekly sessions with your student will take place on Wednesdays, beginning October 15, from 2:30 to 5:00 PM (or alternate day/time following your initial meeting with your student). Missed the first training? No problem! Sign up below for an orientation. Dozens of students each year have come to rely on the advice and help of CSV tutor/mentors around the college application experience. Many of the students are the first in their families to apply to and attend college. You can make an enormous difference. Come learn about best practices from the CRLS Guidance and English departments, as well as from veteran college counselors. You will find out how to break down this often daunting process into manageable and fun steps for seniors. Training materials will be provided.